My g grandparents Isaac and Emily SQUIRE lived here 1885-1924. 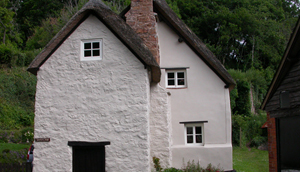 I visited Minehead/Dunster (Somerset England) in 2007 and took this photo of Staunton Cottage. News - Secure encryption is now active, but sometimes it fails. If you are concerned, click this link to restore encryption - Home Page. News - In 2019, I have started writing narratives about each of the 20 or so ancestors that arrived in Adelaide, South Australia, between 1836 and 1920. So far, I have written about John SQUIRE, William RUNDLE, Samuel KEIGHTLEY and Franz Louis MEINCKE. My focus is on researching and writing about the descendants of each immigrant family, and their direct ancestors who mostly came from the UK. In stage 2, I will write about their women/partners, add maps, photos newspaper snippets, etc., and then write about associated families. Welcome - most people arrive here after searching for one of their ancestors. The link for 'First time users' might provide help to find what information I have. The search boxes to the left are worth trying to see who pops up. The 'About me' page might help explain other life connections we may have. I live in Adelaide, Australia, and my web hosting is in the U.S. This web site contains information from around fifty years of research and information accumulation, and celebrates more than thirty years of my web presence. You are free to use my information (with acknowledgement please), but note that details of living people are not generally available. If a source transcript or citation is included, then I have personally found and transcribed the source record. Some of my information has been gathered and validated by others, and while I have confidence in the researcher, I have not checked all the data. I welcome questions, comments or corrections about my research, content, or on any privacy issue. You can Email me at jan@jansquire.com, or use the inbuilt contact forms. I always try to reply within 24 hours. You can also find me on LinkedIn, and on Facebook. See my main surname interests here, with links to more information. Discover who I am, and read about my interests, qualifications, experience, and genealogy studies. A place where I can help you set up your own genealogy space on the web. I can support you to set up your own web presence, or fully maintain your site for reasonable costs. I can also undertake South Australian research or advise on internet genealogy research. Contact me to discuss possibilities. Photo Gallery, including the best of Myanmar October 2016.